The RMP acknowledges that an inventory of desert habitat identified over 378 square miles of land with wilderness characteristics – sufficient size, naturalness, and outstanding opportunities for either solitude or primitive and unconfined recreation – that could be managed to preserve these attributes. However, the preferred alternative would only protect about 15% of these lands. This area in the foreground, east of the Wee Thump Joshua tree woodland qualify as lands with wilderness characteristics, but will not be managed as such in the BLM’s preferred alternative. Spirit Mountain can be seen in the distance. Most of the lands with wilderness characteristics that the BLM chose to respect are in the Gold Butte area of Nevada – which has been eyed as a possible monument – although even some eligible lands within the Gold Butte region will not be counted under the BLM’s preferred alternative. Areas outside of Gold Butte fare worse. Tens of thousands of acres of wildlands near the McCullough Mountains, Searchlight, around the Muddy Mountains, and the Resting Springs Range will be ignored. The draft RMP does not give a rationale for why these lands will be ignored, even though they meet the criteria to be designated as lands with wilderness characteristics. The preferred alternative would establish six new solar energy zones and several areas where wind energy would be encouraged across the region, including two solar energy zones less than 10 miles from Ash Meadows National Wildlife Refuge and a wind energy area immediately adjacent to the most remote corner of the Mojave National Preserve. The draft RMP appears to ignore planning guidance from the Department of Interior because it overestimates the need for solar energy zones in the region, and does not properly analyze the zones that it proposes. The BLM map below shows existing solar energy zones (Dry Lake and Amargosa) in dark blue, and proposed solar energy zones in light blue. You can click on the map to enlarge it. When the Department of Interior first established solar energy zones in 2012, it stated that additional zones could be created after considering whether market conditions and space available in existing solar energy zones merited additional zones (page 168 of the Record of Decision for the Solar Programmatic EIS). Nevada still has a total of five solar energy zones, with two in the area affected by the RMP. Most of the solar energy zone acres in Nevada remain available, which calls into question why the RMP would create six additional zones. Although Nevada plans to increase renewable energy consumption, it has already-disturbed lands, rooftops, and existing solar energy zones that could accommodate more energy generation than the Las Vegas region could use. Although solar uses less water than other types of energy generation, a single utility-scale solar project can still use millions of gallons of water a year for construction and washing dust off of solar panels. Groundwater in the Amargosa area is already scarce, and some agricultural irrigation had to end in the mid-1970s because lowering groundwater supplies threatened to exterminate pupfish that depend on natural springs in and around the Ash Meadows National Wildlife Refuge. The beautiful Amargosa Valley and Ash Meadows. Although not visible, streams and springs dot the landscape and provide important habitat for wildlife. Photo by Basin & Range Watch. The draft RMP proposes the Lathrop Wells and Ash Meadows solar energy zones, both within ten miles of the wildlife refuge, and a third solar energy zone – South Beatty – that would likely draw on the same groundwater supplies. 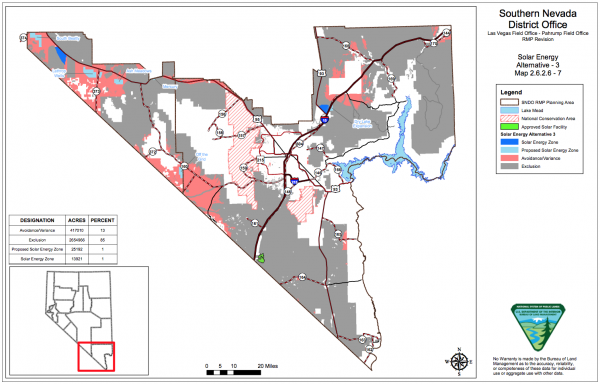 These three proposed zones would join the existing Amargosa Valley solar energy zone, which remains completely available to developers. A total of four solar energy zones in the Amargosa Valley could decimate groundwater supplies and wildlife. In addition to the solar energy zones, the draft RMP would designate areas deemed appropriate for wind energy, and areas where wind energy should be avoided. Some of the proposed “open” wind areas would be on designated critical habitat for the desert tortoise north of Searchlight, and along the Nevada/California border immediately adjacent to the Mojave National Preserve. The “open” wind area next to the Preserve appears to cater to the proposed Crescent Peak wind energy project. As I continue to review the Desert Renewable Energy Conservation Plan (DRECP), I am struck by the disparities between the DRECP and draft Nevada RMP. Unlike the DRECP, the draft RMP for southern Nevada does not consider how much renewable energy could be sited on already-disturbed lands, nor does it have any clear explanation of why the proposed solar energy zones are deemed necessary at this time. The draft RMP also does very little to protect habitat connectivity for wildlife. For example, wind and solar zones would stretch across the Pahrump Valley, potentially fragmenting and severing currently intact habitat linking the Mesquite and Pahrump Valley Wilderness areas on the California side of the border with the Toiyabe National Forest and Red Rock National Conservation Area. A better alternative would designate more of these desert valleys as exclusion areas for energy development. 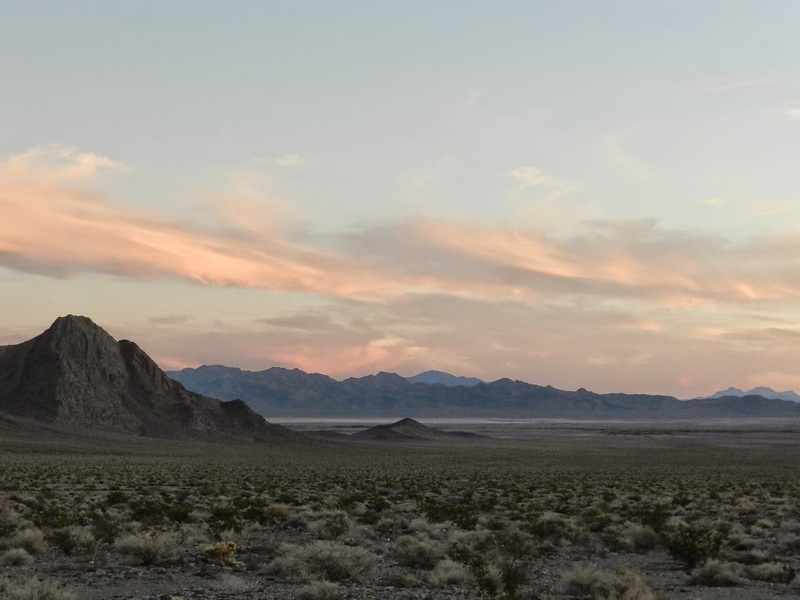 The draft RMP also seems to ignore how energy development along the border with California and immediately adjacent to the Mojave National Preserve could impact recreational values of those connected lands. Wind turbines placed along the Crescent Peaks would introduce an industrial, man-made element to one of the most remote and peaceful corners of the Preserve, and pose a threat to raptors and other birds in the area. Blinking red lights atop turbines would compete with the stars in the desert night sky. And how does increased energy development and water consumption along the Amargosa River in Nevada impact riparian habitat downstream in California, where the Amargosa is designated a wild and scenic river providing key habitat to even more resident and migratory wildlife? These are questions and impacts not fully evaluated in the draft RMP. The draft RMP should be revised to exclude energy development near some of these natural treasures, and consider the role of distributed generation and already-disturbed lands in meeting our renewable energy needs.